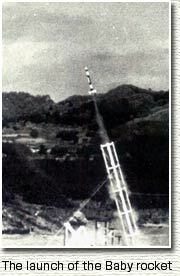 Following the Pencil rocket, the second double base propellant rocket, the Baby, was 120-cm long and about 10 kg in weight with an outer diameter of 8 cm. Fuji Seimitsu had been performing the earlier combustion tests on it. The Baby rocket was a two-stage rocket and it had three models -- the S, the T and the R. These rockets were launched from August through to December in 1955 and all of them reached an altitude of approximately 6 kms. For the S model, we loaded the smoke generator in it for the optical tracking of smoke in order to confirm the flight performance. 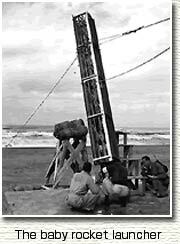 The T model carried the first Japanese telemeter, which was the fruit of the efforts of Takagi, Nomura and the manufacturer of the electrical machinery. The R model carried a camera made by Tsuneyoshi Uemura and we were successful with an experiment to open a parachute on descent and recover the camera. That was the first on-board equipment recovery performed in Japan. At the time of the launch of the first Baby R, a lucky charm that protected Itokawa's loving car was launched aboard it and recovered together with the on-board camera. Needles to say, a picture of Itokawa talking about the pleasure of the world's first equipment recovery at sea with his wet lucky charm in his palm was displayed in the newspapers the next morning. 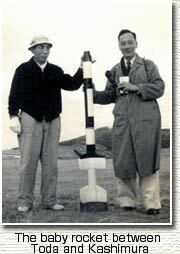 Professor Maruyasu remembers when he was asked by Itokawa, "Can you track the trajectory of a rocket launch using a transit instrument and collect the data to ensure a specific altitude is recorded for the International Geophysical Year (IGY) program?"